Hundreds of Jewish students and youth gathered in New York City on Sunday and called on their peers to reject participation in the free trips offered by Birthright Israel, on the occasion of the program’s 18th anniversary. 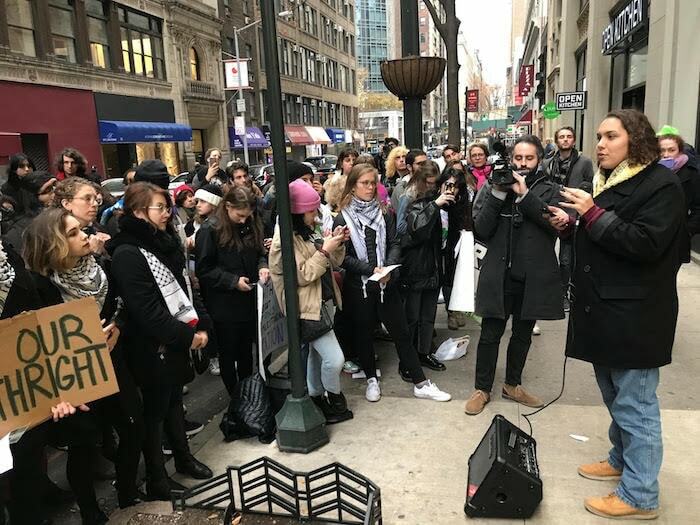 Gathering outside of the offices of the Birthright Israel Foundation in downtown Manhattan, young Jews – some of whom have been on a Birthright trip – decried the injustice of being offered a free trip to Israel, while millions of Palestinian refugees around the world cannot return to their homes. A group of about 10 Jewish Defense League counter-protesters were present. 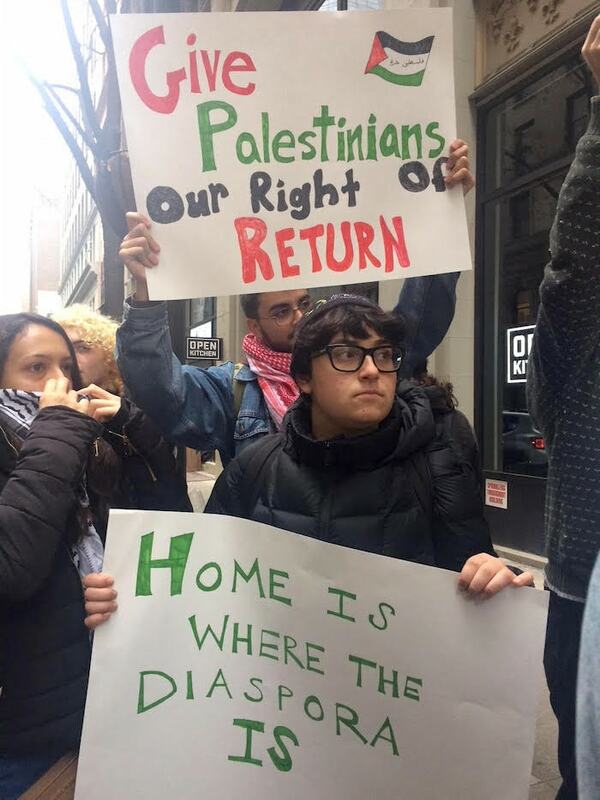 While young Palestinians spoke of the injustices of being denied the right to return to their homeland, young JVP members symbolically returned Birthright plane tickets to Israel, lit Hannukah candles, and rededicated themselves to strong Jewish identities founded upon solidarity and justice, not occupation and apartheid. On Sunday, the Birthright Israel Foundation had planned to host a large 18th anniversary fundraising gala in Manhattan. With tickets running as high as $500,000, right-wing multibillionaire and patron of both Trump and Netanyahu, Sheldon Adelson, was set to receive the “Guardian of the Jewish Future” award for his funding of Birthright trips. However, the gala was postponed a mere six days before the event, after Adelson suffered fractured ribs and was unable to attend. With Adelson convalescing and the gala postponed till Spring 2018, Birthright Israel’s 18th birthday was marked by members of the JVP Student Network stridently asserting an alternative Jewish future based on solidarity. Over 1,000 Jewish students and young Jews have already signed the #ReturntheBrithright pledge, declaring their boycott of the trip. “I participated in the protest because Birthright doesn’t speak for me as a young Jew. It’s important to me that my Palestinian friends have as much of a right to visit the land that I do, and it makes no sense that I am ‘welcomed home’ to Israel, while their families cannot return to the homes they knew for generations. My Judaism is founded upon questioning the world around me, calling out injustice, and standing with the oppressed- and I don’t need a Birthright trip to be proud to be Jewish.” – Nesha Ruther, a sophomore and member of Students for Justice in Palestine at University of Wisconsin-Madison. Rallying outside the Birthright Foundation headquarters, supporters of the boycott effort heard Palestinian students tell about their experiences being separated from family and denied entry to Israel, all while seeing Jewish-American peers sign up for the supposedly benign 10-day Birthright trips. “The Birthright program does not show anything more than an idealized version of Israel. It does not acknowledge the realities of the Palestinian experience, living with the everyday brutalities of Israeli occupation. It will not tell you about my Palestinian friends and family, killed or injured by the Israeli military… time and time again, Palestinians’ stories are erased from what people learn about the Holy Land. Now, we are here to tell our stories.” – Khalid Abudawas, a sophomore and member of Students for Justice in Palestine at New York University. In recent months, Birthright has come under increasing criticism from the American Jewish community, as it was revealed the program chose to end even the rare encounters with Palestinian citizens of Israel that occurred on a few of its trips. Soon after, it was discovered that a popular hostel frequented by young Jews after their Birthright trips was run by supporters of the far-right Meir Kahane, and just last week, it was uncovered that Orthodox groups, which represent a minority of the American Jewish community, now run the majority of Birthright trips. On Sunday, members of JVP asserted that the planned celebration of Sheldon Adelson at Birthright’s 18th anniversary gala offers further confirmation that, at its root, Birthright functions as a propaganda trip that fuses young Jewish identity with perpetual support for Israel’s unending occupation, systemic inequality and denial of refugee rights. The day before the protest, Jewish students and young Jews gathered for an ‘Alternative Birthright’ mini-retreat, where they spent the day celebrating and exploring their Jewish identities and communities. The retreat featured critical and in-depth discussions around Birthright, Israel and Zionism, explorations and sharing of diverse Jewish cultures and histories, and preparation for the next day’s protest. The Jewish youth present confirmed that this is our real Birthright- the joyful, justice-centered young Jewish communities we are building together. In the past, disillusionment with Birthright has spurred Jewish youth to go off the itinerary of their tours, write critical articles and zines, urge their friends to reconsider going, and organize alternative visits in solidarity with grassroots Palestinian movements for justice. This September, JVP students consolidated these efforts into a boycott campaign, with the publication of their #ReturnTheBirthright manifesto. 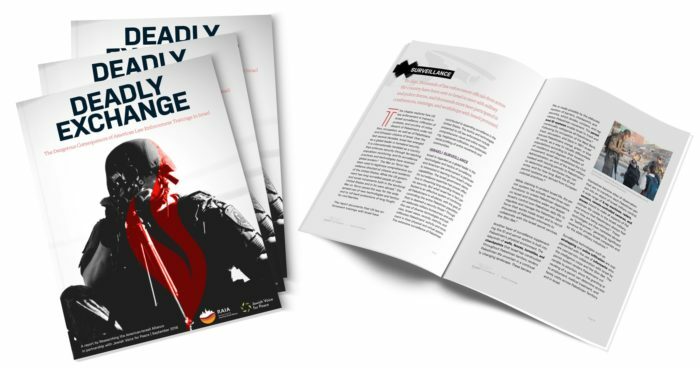 The campaign launch touched a nerve, with numerous major Jewish publications noting and responding to the campaign’s strident acknowledgment of Palestinian right of return. 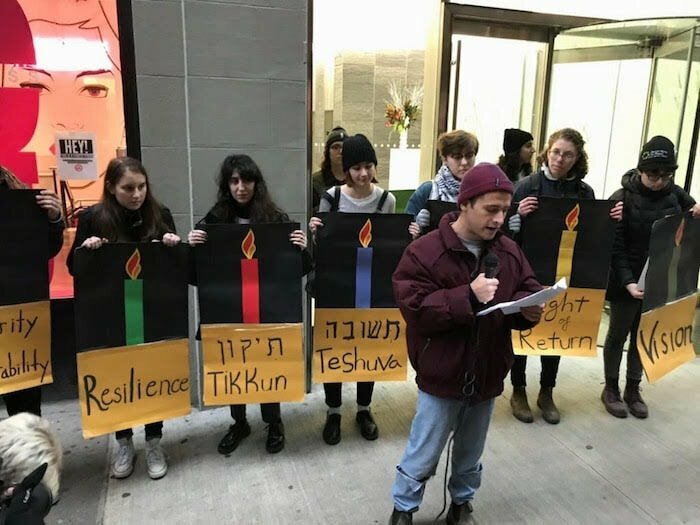 Over the weekend, the students leading the campaign brought together hundreds of their peers to take action against a discriminatory trip while demonstrating a strong collective identity and sense of Jewish history.